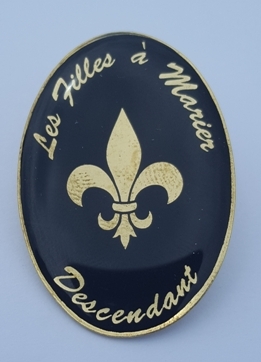 Are you a Filles à Marier Descendant? Must have come over at marriageable age (12 thru 45). Must not have been accompanied by or joining a husband. 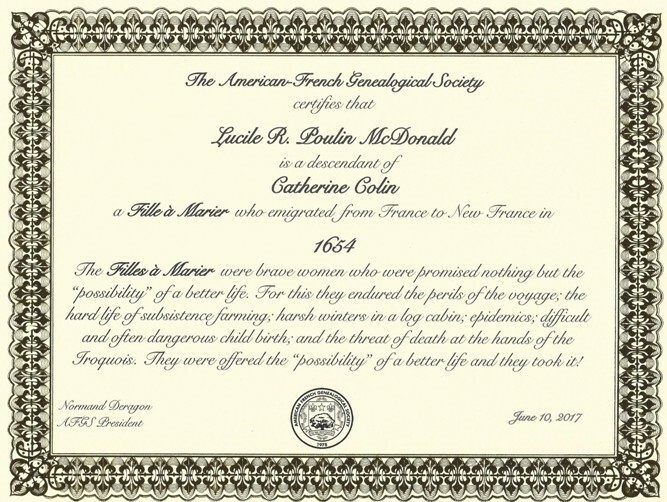 As you do your genealogy, you are sure to find at least one fille à marier amongst your ancestors. These remarkable women were offered the chance at a better life and they took it! AFGS invites you to recognize your Filles à Marier! Here is what to do. Send us a straight line chart starting with you and ending with you fille`à marier. A sample and a list of the filles à marier are included in the downloads. You must include the date and place of each marriage. We will send you a specially designed lapel pin identifying you as a descendent, a certificate with your name as well as the name of the woman from whom you descend and a folder to hold your certificate. accompanied by a pin will be $18.00. certificate with a pin. Additional certificates without pins will be $18.00. Every certificate accompanied by a pin will be $23.00. We will check each straight line for accuracy. Below are the forms and information about this project in pdf format: (a sample straight line chart and the list of names and spouses also appear in the text below). Michelle m. Jacques Perrault dit Villedaigre; LE LABOUREUR, Anne m. Jean Normand oe Lenormand dit Le Jeune; LEBOEUF, Marguerite m. Gabriel Lemieux; LEBREUIL, Louise-Marie m. Marin Deniau dit Destaillis and Charles Boyer; LECLERC, Adrienne m. Romain Duval and Nicolas Hamelin; LECLERC, Marguerite m. Nicolas Leblond and Jean Rabouin; LECLERC, Marie m. Jean-Galleran Boucher; LEDET or LÉODET, Anne m. Jean Neveu or Nepveu and Gilles Pinel; LELIÈVRE, Françoise m. Gabriel Gosselin; LEMAÎTRE, Denise m. Pierre Perras dit Lafontaine and François Cael; LEMOINE or LE MOYNE, Jeanne m. Jacques LeBer dit Larose; LEMOINE or LE MOYNE, Anne m. Michel Messier; LEROUGE dite SAINT-DENIS, Jeanne m.